Background and Context: Different adjuvants been tried out for neuraxial anesthesia in emergency caesarean section so that the dose of the local anesthetic can be reduced and hypotension thereby prevented. Aims and Objectives: The present study was carried out in patients presenting for emergency lower segment caesarean section (LSCS) to establish the dose of intrathecal clonidine that would allow reduction of the dose of local anesthetic (thereby reducing the incidence and magnitude of hypotension) while at the same time providing clinically relevant prolongation of spinal anesthesia without significant side effects. Materials and Methods: This randomized clinical study was carried out in our institution among 100 pregnant females who underwent emergency caesarean section. The participants were divided randomly into four groups: A, B, C, and D, each comprising 25 parturients. Subarachnoid block was performed using a 26G Quincke needle, with 12 mg of hyperbaric bupivacaine (LA) in group A, 9 mg of LA + 30 μg of clonidine in group B, LA + 37.5 μg of clonidine in group C, and LA + 45 μg of clonidine in group D. The solution was uniformly made up to 2.2 mL with normal saline in all the groups. Onset of analgesia at T 10 level, sensory and motor blockade levels, maternal heart rate and blood pressure, neonatal Apgar scores, postoperative block characteristics, and adverse events were looked for and recorded. Statistical analysis was carried out with SPSS® version 10.0 for Windows® , using the ANOVA test with post hoc significance, the Chi-square test, and the Mann-Whitney U test. P<.05 was considered significant and P<.0001 as highly significant. Results: One hundred patients were enrolled for this study. The four groups were comparable with regard to demographic data and neonatal Apgar scores. Onset and establishment of sensory and motor analgesia was significantly shorter in groups C and D, while hypotension (and the use of vasopressors) was significantly higher in groups A and D. Perioperative shivering, nausea, and vomiting were significantly higher in groups A and D, while incidence of dry mouth was significantly higher in group D.
Conclusions: The addition of 45 μg, 37.5 μg, and 30 μg of clonidine to hyperbaric bupivacaine results in more prolonged complete and effective analgesia, allowing reduction of up to 18% of the total dose of hyperbaric bupivacaine. From the results of this study, 37.5 μg of clonidine seems to be the optimal dose. Sometimes, the indications for LSCS are so urgent that there is hardly any time for fluid preloading. One way to achieve normotensive regional anesthesia is to use graded epidural injection but, in the emergency scenario, this technique is not feasible as it is time consuming. Therefore, one has to resort to either general anesthesia or intrathecal administration of drugs for achieving rapid anesthesia. General anesthesia is associated with a lot of hazards in pregnant patients, while with spinal anesthesia hypotension is a common problem, the incidence of which increases proportionally with increase in the volume of the local anesthetic. In the last decade, in the search for possible alternatives to neuraxial opioids, alpha-2 agonists like clonidine and dexmedetomidine have been extensively evaluated for use as adjuvants in regional anesthesia. When used in neuraxial anesthesia, alpha-2 agonists not only prolong the postoperative analgesic period but are also devoid of side effects like nausea, vomiting, urinary retention, pruritus, respiratory depression, etc., which are all commonly associated with the use of neuraxial opioids. , However, conventional doses of intrathecal clonidine (1 μg/kg) are associated with side effects like maternal hypotension and sedation. We undertook this study to evaluate the effectiveness of lower doses of clonidine in reducing the dose of the local anesthetics in neuraxial anesthesia, the main aim being to reduce the incidence and magnitude of hypotension due to the local anesthetic and to prolong the duration of postoperative analgesia in patients undergoing emergency LSCS. Approval for the study was obtained from the ethics committee of the institute. During the period of study from 1 st February to 30 th November, 2010, 312 pregnant patients presented to the emergency ward of our institute with labor pains. They were at various stages of labor and were all shifted to the emergency labor room. From among these patients, 100 parturients with ASA physical status I or II who underwent emergency caesarean delivery were selected randomly for inclusion in the study. Those parturients who had history and/or clinical evidence of cardiac disease, hematological disease, diabetes, eclampsia, coagulation abnormalities, and history of allergy to local anesthetics were not included in this study. Coded envelopes were used to randomly allocate patients into one of four groups (groups A, B, C, and D) so that each group had 25 patients. Group A was administered intrathecal local anesthetic solution of 0.5% (12 mg) hyperbaric bupivacaine, while groups B, C, and D were administered 0.5% (9 mg) hyperbaric bupivacaine along with 30 μg, 37.5 μg, and 45 μg of clonidine, respectively. The solution was uniformly made up to 2.2 mL with normal saline in all the groups. The study solution was prepared at the time of caesarean section by an anesthesia technician who was given written instructions but was not aware of the study design. In the operation theater, preloading was achieved with lactated Ringer's solution, 10 mL/kg body weight, infused during preparation for subarachnoid block. Baseline values for heart rate (HR), mean arterial pressure (MAP), peripheral oxygen saturation (SpO 2 ), and respiration rate (RR) were recorded. Spinal anesthesia was performed at the L 3-4 interspace in all the groups using a 26G Quincke needle with the patient in the left lateral position. Immediately after injection of the solution, the patients were gently placed supine with left uterine displacement, and a pillow was placed under the head. After the spinal block was administered, HR, RR, SpO 2 , and MAP were observed continuously and recorded every 2 minutes until delivery, every 5 minutes for the next 30 minutes, and thereafter every 10 minutes till completion of the surgical procedure. Fluid was administered as per the maintenance requirement and for replacing the ongoing losses. For the present study, hypotension was defined as 20% decrease from baseline MAP, and treatment was with 3-6 mg incremental boluses of IV mephentermine. Patients were administered supplementary oxygen through a face mask during the surgical procedure. The level and duration of sensory anesthesia, defined as the loss of sharp sensation, was evaluated by using the pinprick test every 2 minutes until analgesia level reached the T 5 -T 6 dermatome and thereafter every 10 minutes till the completion of surgery. The following variables were recorded: time to initial onset of analgesia at T 10 ; time to maximum cephalad spread of analgesia; highest level of analgesia; time to two-segment regression of analgesic level, and regression of analgesic level to the S 2 dermatome. The quality of anesthesia (judged by the anesthetist), the quality of muscle relaxation (judged by the surgeon), and the degree of intraoperative comfort (judged by the patient) were recorded as excellent, good, fair, or poor. Time to motor block was assessed using a modified Bromage scale (0 = no motor block, 1= inability to raise extended leg, 2 = inability to flex knee, and 3 = inability to flex ankle and feet) until complete motor block was achieved and then every 15 minutes until the return of normal motor function. The time to first rescue analgesia was observed and recorded. During the intraoperative period, the incidence of dry mouth, nausea, vomiting, pruritus, shivering, and requirement of sedation were also recorded. Nausea and vomiting were treated with 4 mg intravenous ondansetron. Maternal sedation scores were evaluated and recorded intra- and post-operatively until the block had worn off, using a subjective grading score, from 0 = no sedation to 3 = deep sedation with arousal on vigorous shaking. After delivery, Apgar scores at 1, 5, and 10 minutes were evaluated and recorded. At the end of study the data was subjected to statistical analysis using SPSS® version 10.0 for Windows® ; we employed ANOVA test with post hoc significance for continuous variables and the chi-square and Mann-Whitney-U tests as appropriate for categorical data. Standard deviations for duration of sensory block onset at S 2 level in all the groups were used for power analysis. To detect a 30-minute difference between the groups in the mean duration of time to regression to the S 2 segment, a group size of 22 was considered necessary (two-sided α of 5% and β of 20%). P < 0.05 was considered significant and P < 0.0001 as highly significant. The groups were comparable with regard to demographic profile as there was no statistically significant difference between the groups with regard to variables like age, weight, height, weeks of gestation, and duration of surgery [Table 1]. The block was achieved up to a height of T 5-6 in all the cases with a uniform volume of 2.2 mL of the local anesthetic solution. The time to onset of analgesia at T 10 was significantly shorter in group D (2.10±0.64 minutes), group C (2.32±0.81 minutes), and group B (2.62±0.68 minutes) as compared to group A (3.58±0.92 minutes). 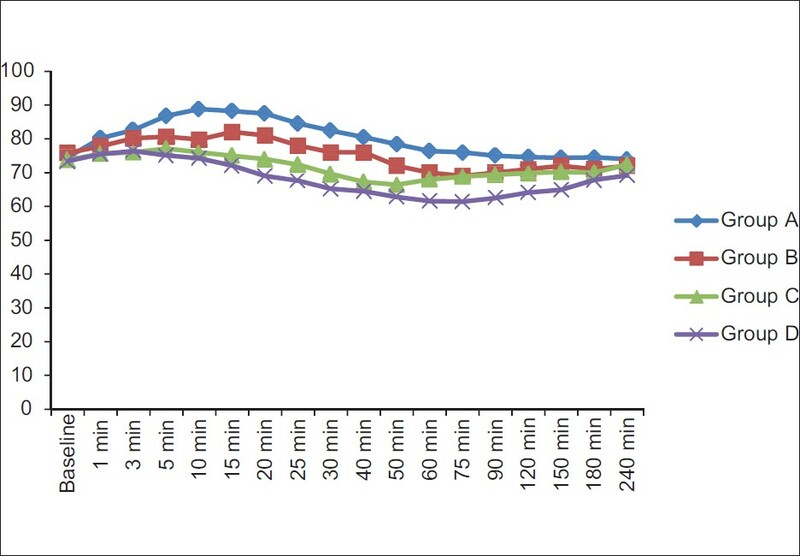 Increasing the dose of clonidine progressively shortened the time to achieve maximum sensory analgesic level and complete motor blockade; this was statistically significant Surprisingly, the use of vasopressors to maintain hemodynamic stability was significantly higher in the non-clonidine group (group A) [Table 2]. Postoperatively, the scenario was similar, with the time to segmental regression of sensory analgesia to S 2 , the time to demand for the first rescue analgesic, and the time to complete recovery from the effect of spinal blockade increased progressively (and significantly) with increase in the intrathecal doses of clonidine [Table 3]. There was no statistically significant difference between the groups in the Apgar scores of the newborns at 1 and 5 minutes [Table 4]. We observed a comparatively higher incidence of nausea and vomiting in groups A and D, which may be attributable to the higher incidence of hypotension in these two groups. A significantly higher incidence of shivering in groups A and D may again be attributable, at least partially, to a comparatively higher incidence of hypotension in these groups [Table 4]. The much higher incidence of dry mouth in group D can be ascribed to the slightly higher dose of clonidine; this difference was statistically significant (P < 0.05). Patients receiving hyperbaric bupivacaine showed significant tachycardia, which can be attributed to a reflex increase due to the associated hypotension. There was significantly greater bradycardia in group D in comparison to the other groups but this returned to normal within 2-3 hours after surgery [Figure 1]. At no time was hemodynamic stability compromised, and atropine was administered only when the decrease in mean HR was greater than 25% from the baseline. Group C showed the greatest hemodynamic stability and the least fluctuation of hemodynamic parameters. Figure 1: Graphical comparison of mean heart rates in the four groups. The hypotension was profound in the group A where we administered 12 mg of hyperbaric bupivacaine. The use of vasopressors to maintain a normotensive intraoperative course was greatest in group A. Again, a very stable hemodynamic picture was observed in group C. When the dose of intrathecal clonidine was increased to 45 μg (group D), the MAP decreased; this decrease was statistically significant [Figure 2]. 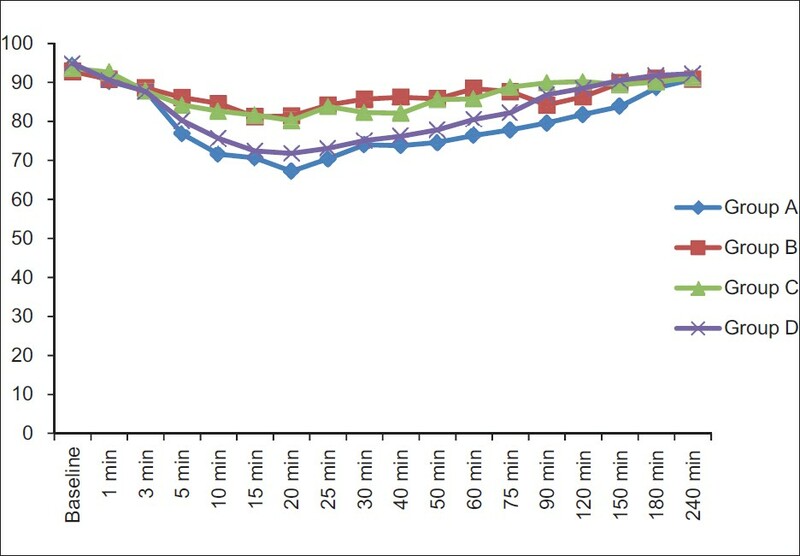 We administered vasopressors and atropine to maintain a stable hemodynamic milieu and at no time were the hemodynamic parameters allowed to fall by more than 25% of the baseline value. 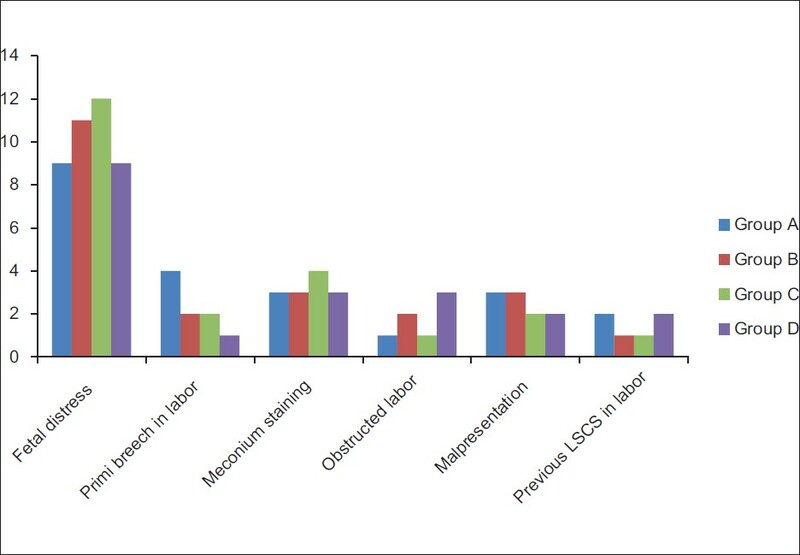 [Figure 3] shows the frequencies of the various clinical indications for emergency LSCS in all the groups. The groups were comparable and the differences in the frequencies were not statistically significant (P > 0.05). Ever since the introduction of neuraxial anesthesia into clinical practice spinal anesthesia has been the commonest technique and it continues to be so even in this era of advanced obstetric care. Hyperbaric bupivacaine is still the commonest drug used, and hypotension is the most common (and irritating) complication of subarachnoid block in parturients, with a reported incidence of 20%-100% in elective LSCS and 60%-100% in emergency LSCS. ,,, Better understanding of fluid balance and the judicious use of intravenous fluids and vasopressors have had great impact on the preservation of hemodynamic stability and improved obstetrical anesthesia The controversies surrounding the use of crystalloids and colloids in the prevention of hypotension seem unending, but the use of either is definitely associated with lower requirement of the vasopressors. , The quest continues to find the optimal dose of local anesthetic for spinal anesthesia, i.e., the dose that does not induce hypotension and at the same time provides adequate surgical anesthesia. The use of adjuvants has revolutionized neuraxial anesthesia by providing similar surgical conditions as is achieved with conventional dosing regimens, but with lower dosage of local anesthetics, thus decreasing the risk of hypotension during. The present study included 100 pregnant females with comparable demographic profiles and successful spinal block was achieved in all the patients, which made the results of the present study an ideal platform for statistical analysis and comparison without any visible or confounding bias. Patients presenting for emergency caesarean section require a quick but thorough assessment of their general condition and hemodynamic status and usually need rapid surgical intervention. In such cases, it is not prudent to wait for optimization of fluid status and one has to proceed with challenging anesthetic management as soon as possible. In pregnant females presenting for emergency LSCS the conventional doses of local anesthetics can produce an exaggerated response with regard to hypotension and shock, while lower doses may provide inadequate surgical conditions in patients. Various studies have been conducted on dose reduction of local anesthetic by addition of adjuvants and it was concluded that in pregnant patients a dose greater than 9 mg is invariably associated with higher incidence of hypotension, nausea, vomiting, and increased consumption of vasopressors. ,,,, Intrathecal alpha-2 agonists significantly prolong the duration of pain-free postoperative period and possibly allow reduction of the dose of local anesthetic. Therefore, addition of clonidine in the present study was also aimed at prolonging the postoperative analgesic period. We used 12 mg of hyperbaric bupivacaine in group A, while groups B, C and D received 9 mg of bupivacaine admixed, respectively, with 30 μg, 37.5 μg, and 45 μg of clonidine hydrochloride. The magnitude of the hypotension was significantly greater (>26%) in the group where only hyperbaric bupivacaine was administered. In the groups that also received clonidine at no time did the MAP fall below 18% of the baseline value. Among the clonidine groups, we observed maximal hemodynamic stability in groups B and C where we used 30 μg and 37.5 μg of intrathecal clonidine, respectively, as the HR and MAP never fell by more than 12% of baseline value in either of these groups. But the significant differences between these two groups included a prolongation of analgesic effect in group C (176.6±11.2 minutes) as compared to group B (162.3±8.4 minutes) despite similar hemodynamic stability in both the groups. Pregnant patients are greater risk of experiencing side effects like respiratory depression, pruritus, nausea, and vomiting following administration of neuraxial opioids. The reason for selecting a low dose of hyperbaric bupivacaine and addition of clonidine as an adjuvant was to prevent the incidence of hypotension and reduce its magnitude and that of other opioid-related side effects and also to find out the safe dosage of local anesthetics for both the mother and the fetus. At a lower intrathecal dose, i.e., less than 0.5 μg/kg body weight, clonidine is devoid of its various side effects, including hypotension and bradycardia, but at the same time it can exert its antinociceptive effect to a significant extent. ,,,, Based on these facts, we administered low doses of intrathecal clonidine along with local anesthetic to determine the optimal dose in LSCS. The use of clonidine as an adjuvant has been studied extensively in obstetrical anesthesia, ,,,[26 ] but to the best of our knowledge this study is the first in which clonidine has been used with hyperbaric bupivacaine to determine the optimal dose of intrathecal bupivacaine. It is an established fact that subarachnoid block in full-term pregnant females achieves a higher than normal dermatomal level, and this prompted us further to reduce the dose of spinal anesthetic. Most of the earlier studies have established that clonidine prolongs the duration and depth of motor blockade. ,, and that this effect strongly correlates with the dose of intrathecal clonidine. Similar results were found in our study as we too recorded a progressive increase in mean duration of sensory analgesia and motor blockade with increasing doses of clonidine. The route of administration and dosage of clonidine determines the severity of side effects and neuraxial clonidine is known to be associated with hypotension, bradycardia, sedation, and dry mouth. , These side effects are usually observed 15-20 minutes after intrathecal injection of clonidine;  however, no significant hypotension, bradycardia, and sedation were observed in our patients. The high incidence of nausea and vomiting in our study in the group A and group D can possibly be ascribed to the greater magnitude of hypotension in these patients [Table 5]. It was very clear from the present study that the hemodynamic effects of intrathecal clonidine starts increasing significantly at a dose of 45 μg. Also, at this dose, the known side effects like dry mouth also start getting exaggerated, reaching statistically significant levels. Our results are more or less similar, as we too did not observe sedation even with 45 μg of intrathecal clonidine. All the hemodynamic side effects of intrathecal clonidine are mediated via inhibition of the sympathetic nervous system and augmentation of the parasympathetic outflow. , Neonatal health was the main concern for us during the study although earlier studies utilizing 15-150 μg of clonidine during parturition have reported hypotension in mother without any effect on the neonatal Apgar scores. ,,,,,, There was no adverse effect in any newborn in our study that could be attributed to intrathecal clonidine as the Apgar scores were normal and comparable in all the neonates and later, during follow-up, we found that feeding was normal in all the infants. The addition of 45 μg, 37.5 μg, and 30 μg of clonidine to hyperbaric bupivacaine results in more prolonged complete and effective analgesia and allows reduction of up to 18% of the total dose of hyperbaric bupivacaine. From this study it appears that 37.5 μg of clonidine is the optimal dose; at this dose the incidence and magnitude of hypotension was the lowest and there were the least side effects. 1. Jenkins JG, Khan MM. Anaesthesia for Caesarean section: A survey in a UK region from 1992 to 2002. Anaesthesia 2003;58:1114-8. 2. Agarwal A, Kishore K. Complications and Controversies of Regional Anaesthesia: A Review. Indian J Anaesth 2009;53:543-53. 3. Ngan Kee WD, Khaw KS, Lee BB, Lau TK, Gin T. A dose-response study of prophylactic intravenous ephedrine for the prevention of hypotension during spinal anesthesia for cesarean delivery. Anesth Analg 2000;90:1390-5. 4. Rout CC, Rocke DA, Levin J,Gouws E, Reddy D. A reevaluation of the role of crystalloid preload in the prevention of hypotension associated with spinal anesthesia for elective cesarean section. Anesthesiology 1993;79:262-9. 5. Tercanli S, Schneider M, Visca E, Hösli I, Troeger C, Peukert R, et al. Influence of volume preloading on uteroplacental and fetal circulation during spinal anaesthesia for Caesarean section in uncomplicated singleton pregnancies. Fetal Diagn Ther 2002;17:142-6. 6. Roberts SW, Leveno KJ, Sidawi JE, Lucas MJ, Kelly MA. Fetal acidemia associated with regional anesthesia for elective Cesarean delivery. Obstet Gynecol 1995;85:79-83. 7. Skillman CA, Plessinger MA, Woods JR, Clark KE. Effect of graded reductions in uteroplacental blood flow on the fetal lamb. Am J Physiol 1985;249:H1098-105. 8. Lee A, Ngan Kee WD, Gin T. Prophylactic ephedrine prevents hypotension during spinal anesthesia for cesarean delivery but does not improve neonatal outcome: Aquantitative systematic review. Can J Anaesth 2002;49:588-99. 10. Lee A, Ngan Kee WD, Gin T. A dose-response meta-analysis of prophylactic intravenous ephedrine for the prevention of hypotension during spinal anesthesia for elective cesarean delivery. Anesth Analg 2004;98:483-90. 11. Lai FM, Jenkins JG. Ventricular bigeminy during phenylephrine infusion used to maintain normotension during caesarean section under spinal anaesthesia. Int J Obstet Anesth 2007;16:288-90. 12. Fan SZ, Susetio L, Wang YP, Cheng YJ, Liu CC. Low dose of intrathecal hyperbaric bupivacaine combined with epidural lidocaine for Cesarean section: A balance block technique. Anesth Analg 1994;78:474-7. 13. Ben-David B, Miller G, Gavriel R, Gurevitch A. Low-dose bupivacaine-fentanyl spinal anesthesia for cesarean delivery. Reg Anesth Pain Med 2000;25:235-9. 14. Vercauteren MP, Coppejans HC, Hoffmann VL, Saldien V, Adriaensen HA. Small-dose hyperbaric versus plain bupivacaine during spinal anesthesia for cesarean section. Anesth Analg 1998;86:989-93. 15. Vercauteren MP, Coppejans HC, Hoffman VH, Mertens E, Adriaensen HA. Prevention of hypotension by a single 5-mg dose of ephedrine during small dose spinal anesthesia in prehydrated Cesarean delivery patients. Anesth Analg 2000;90:324-7. 16. Coppejans HC, Hendrickx E, Goossens J, Vercauteren MP. The sitting versus right lateral position during combined spinal-epidural anesthesia for Cesarean delivery: Block characteristics and severity of hypotension. Anesth Analg 2006;102:243-7. 17. Celleno D, Capogna G, Costantino P, Zangrillo A. Comparison of fentanyl with clonidine as adjuvants for epidural analgesia with 0.125% bupivacaine in the first stage of labour. Int J Obstet Anesth 1995;4:26-9. 18. Bajwa SJ, Bajwa S, Jasbir Kaur. Comparison of epidural ropivacaine and ropivacaine clonidine combination for elective cesarean sections. Saudi J Anaesth 2010;4:47-54. 20. Morgan PJ, Halpern SH, Tarshis J. The effects of an increase of central blood volume before spinal anesthesia for cesarean delivery: A qualitative systematic review. Anesth Analg 2001;92:997-1005. 21. Dyer RA, Farina Z, Joubert IA, Du Toit P, Meyer M, Torr G, et al. Crystalloid preload versus rapid crystalloid administration after induction of spinal anaesthesia (coload) for elective caesarean section. Anaesth Intensive Care 2004;32:351-7. 22. Bajwa SJ, Bajwa SK, Kaur J, Singh G, Arora V, Gupta S, et.al. Dexmedetomidine and clonidine in epidural anaesthesia: A comparative evaluation. Indian J Anaesth 2011;55:116-21. 23. Acalovschi I, Bodolea C, Manoiu C. Spinal anesthesia with meperidine, effects of added -adrenergic agonists: Epinephrine versus clonidine. Anesth Analg 1997;84:1333-9. 24. D'Angelo R, Evans E, Dean LA, Gaver R, Eisenach JC. Spinal clonidine prolongs labor analgesia from spinal sufentanil and bupivacaine. Anesth Analg 1999;88:573-6. 25. Chiary A, Lorber C, Eisnach JC, Wildling E, Krenn C, Zavrsky A, et al. Analgesic and hemodynamic effects of intrathecal clonidine as the sole analgesic agent during first stage of labor. Anesthesiology 1999;91:388-96. 26. Sia AT. Optimal dose of intrathecal clonidine added to sufentanil plus bupivacaine for labour analgesia. Can J Anaesth 2000;47:875-80. 27. Benhamou D, Thorin D, Brichant JF, Dailand P, Milon D, Schneider M. Intrathecal clonidine and fentanyl with hyperbaric bupivacaine improves analgesia during cesarean section. Anesth Analg 1998;87:609-13. 28. Gautier PE, De Kock M, Fanard L, Van Steenberge A, Hody JL. Intrathecal clonidine combined with sufentanil for labor analgesia. Anesthesiology 1998;88:651-6. 29. DeKock M, Gautier P, Fanard L, Hody JL, Lavand'homme P. Intrathecal ropivacaine and clonidine for ambulatory knee arthroscopy. Anesthesiology 2001;94:574-8. 30. Choi DH, Ahn HJ, Kim JA. Combined low-dose spinal-epidural anesthesia versus single shot spinal anesthesia for elective cesarean delivery. Int J Obstet Anesth 2006;15:13-7. 31. Coppejans HC, Vercauteren MP. Low-dose combined spinal-epidural anesthesia for Cesarean delivery: Acomparison of three plain local anesthetics. Acta Anaesthesiol Belg 2006;57:39-43. 32. Chen X-Z, Chen H, Lou A-F, Lu¨ C-C. Dose-response study of spinal hyperbaric ropivacaine for caesarean section. J Zhejiang Univ Sci B 2006;7:992-7. 33. Teoh WH, Thomas E, Tan HM. Ultra-low dose combined spinal-epidural anesthesia with intrathecal bupivacaine 3.75 mg for cesarian delivery: A randomized controlled trial. Int J Obstet Anesth 2006;15:273-8. 34. Yanagidate F, Hamaya Y, Dohi S. Clonidine premedication reduces maternal requirement for intravenous morphine after cesarean delivery without affecting newborn's outcome. Reg Anesth Pain Med 2001;26:461-7.